Amanda Greive graduated with a bachelor’s degree in visual arts from the University of Illinois at Springfield in 2008 and has exhibited her work both locally and nationally. She was also a juried member of the Chicago Artist’s Coalition’s HATCH project for 2011-12. Most recently, she was a finalist in the 2017 FIgurativas exhibit in Barcelona, and a Rehs Contemporary Award winner in the 13th ARC International Salon. Her studio is located in Central Illinois. Amanda’s hyper-realistic compositions reference both classical and contemporary symbolism and iconography. 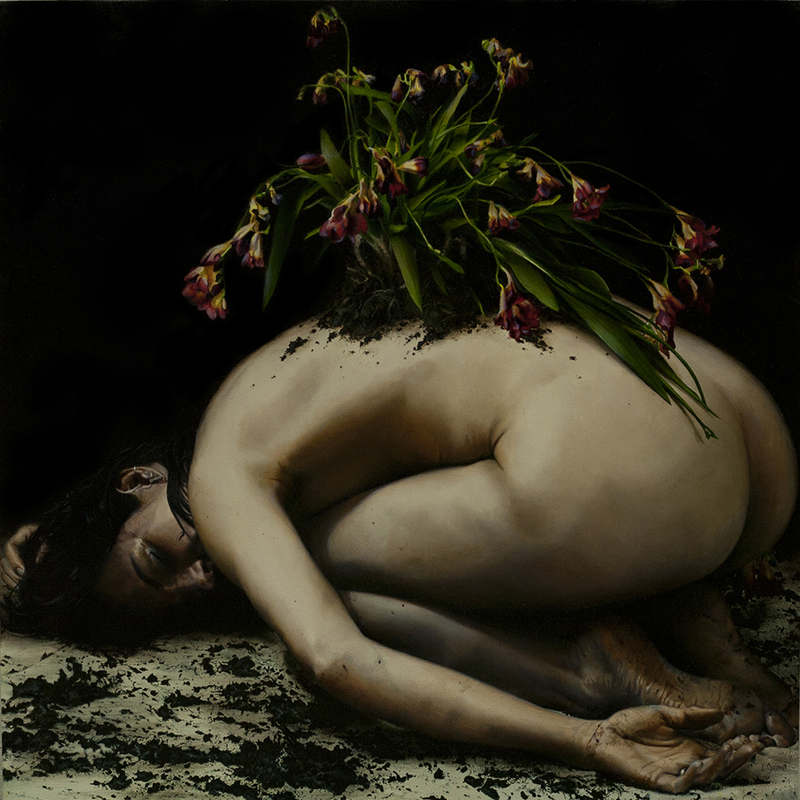 While the primary motivation behind her work is to tease out the nuanced emotions embedded within the human condition and to confront isolation and anxiety born of gender-based stereotypes, she also looks to comment on the contradiction between creating realistic imagery and portraying emotional rawness, as well as the uncompromised truth in the imagery portrayed versus it’s symbolic ambiguity. Amanda’s most recent work includes paintings of women in a variety of positions with flowers coming out of their backs, balancing on their foreheads, or covering their faces. She aims to address the emotional and societal pressure to conform to a certain ideal that women face, as well as her interest in the symbolic duality of flowers as fragile, beautiful and sexual but also strong, persistent and adaptable.